Since this is a limited engagement at the Shakespeare Theatre Company (part of the Basil Twist Festival D.C.) closing on March 25, I’ll be blunt: go see it. Petrushka‘s score is performed live by two twin pianists, and it’s a joy to hear Stravinsky’s music interpreted by Julia and Irina Elkina. First a prelude of sonatas lulls the audience, accustoming us to the puppetry and the small stage with an almost elegiac world of simple shapes. 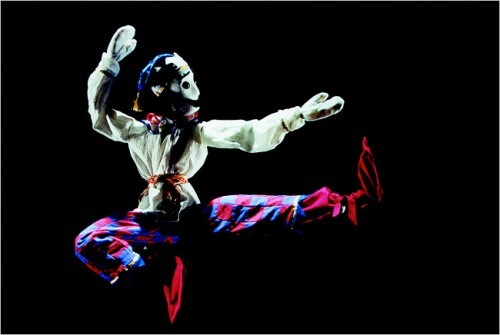 Once Petrushka properly begins, the archetypes of the moor, the ballerina and the clown are introduced as marionettes before the explode into life-size, dancing their puppet hearts out in full exuberance. Or rather, the puppeteers are dancing their hearts out, their presence alluded to by the puffy floating hands of the onstage puppet master. Puppeteer made puppet, absurdly perfect. There are just too many magical images to note – even the word magical doesn’t seem a cliche, as Twist’s production restores the word and the emotion behind it. It also reclaims the final moment of Petrushka to be one of joy (rather than mocking revenge as in the Ballet Russes production), as the puppet clown escapes from the proscenium’s strict confines with such wonder than the entire theater feels full of happiness. As your heart follows what your mind knows is just an illusion, everything suddenly seems brighter, more hopeful, truly beautiful. 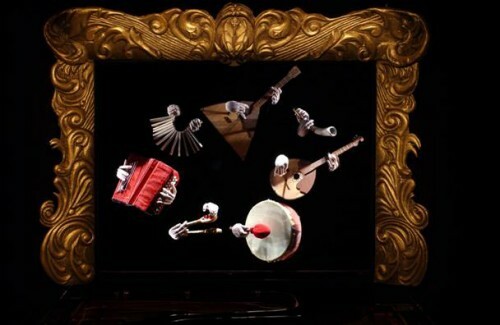 Basil Twist’s production of Petrushka performs through March 25 at the Shakespeare Theatre Company’s Lansburgh Theatre, located at 450 7th Street NW, Washington, DC 20004. Closest Metro stop: Archives/Navy Memorial (Yellow/Green lines), Gallery Place/Chinatown (Red/Yellow/Green lines). For more information call 202-547-1122.